CSE and the Chicago Park District are proud to partner to bring this monumental work to Chicago. John Henry has a long history in Chicago, first at the School of the Art Institute of Chicago as a student and later as a teacher. Along the way he has served on art advisory boards for the City of Chicago, and many other national and international organizations. 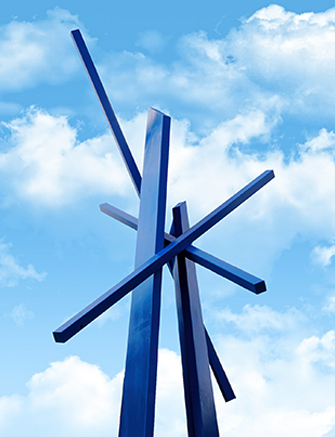 The abstract, geometric, monumental design is perfectly representative of this world-renowned sculptor. “Chevron” stands a majestic 50’ tall and 30’ wide. 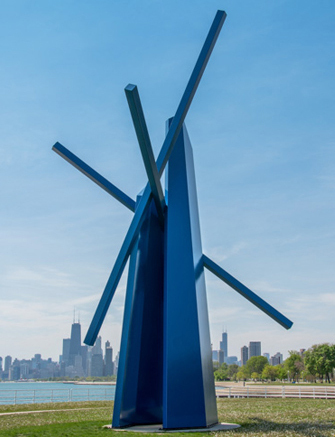 John Novak has graciously loaned Chevron to CSE and the Chicago Park District for the 2015 exhibition. We are most grateful for this opportunity. It is a great pleasure to bring Chevron to our lakefront.